Stage One of Kerrisdale Gardens consists of 26 architecturally designed independent villas and 26 apartments set over three levels to take advantage of the endless views and provide easy access to community facilities. The Exsulite-Kooltherm thermal facade product was chosen as the preferred cladding system by Paynter Dixon for the four-storey project to meet both design and functional objectives. The cladding system not only needed to achieve a contemporary, modern look but also have the ability to reduce maintenance and withstand the harsh climactic conditions. The developer sought a thermally efficient multi-residential lightweight walling solution that could be installed quickly and easily to reduce scaffolding time on site. It was also important for the cladding system to be able to withstand the high wind pressures of the cyclonic rated location. Dulux AcraTex supplied a fully integrated lightweight, non-load bearing wall cladding system comprising of a breathable wall wrap, Kingspan Kooltherm K5 phenolic panels, fixings and Exsulite weatherproof coating system. The substrate consists of a Kingspan Kooltherm K5 80mm panel fixed onto a 25mm top hat over a steel frame construction. Kingspan Kooltherm K5 panels in the Exsulite-Kooltherm thermal facade system are coated with Exsulite weatherproof coating system. The installation by a Dulux AcraTex Exsulite Trained and Registered Installer ensured peace of mind for all project stakeholders. 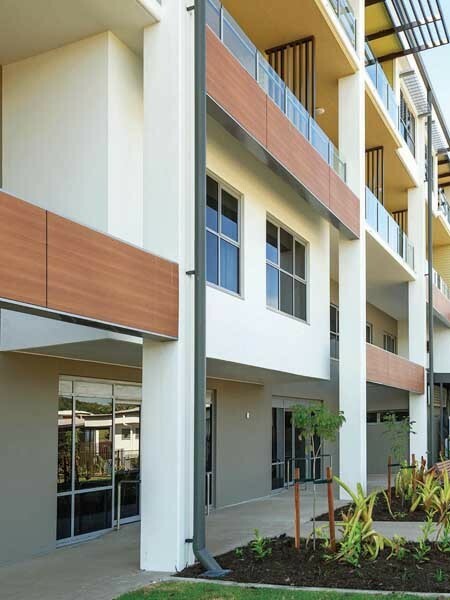 The Exsulite-Kooltherm facade system is also CodeMark accredited in accordance with National Construction Code (NCC) requirements as an alternative solution for use in both Cyclonic and Non Cyclonic Regions, Bush Fire Regions and where a Fire Rated Wall (FRL) requirement needs to be met. The Exsulite-Kooltherm thermal facade system was supplied in its entirety by Dulux and installed by a Dulux Trained Exsulite Installer, ensuring the project was built to specification without deviation or component substitution. The Exsulite-Kooltherm lightweight cladding system helped to reduce construction times with faster and easier installation compared to traditional construction methods and also reduced scaffolding time on site, contributing to the job’s completion ahead of schedule. Exsulite-Kooltherm’s lightweight cladding system could be easily moved without the need for cranes or forklifts on site minimising OHS issues. Dulux AcraTex Account Manager, Nigel Ward adds that the Exsulite-Kooltherm lightweight cladding system offers acoustic benefits and high thermal performance of up to R7 subject to system specification, helping to eliminate thermal bridging. The facade system provided the designer and builder more design flexibility compared to other traditionally used systems, allowing Dulux to advance the system’s application into cyclonic regions.